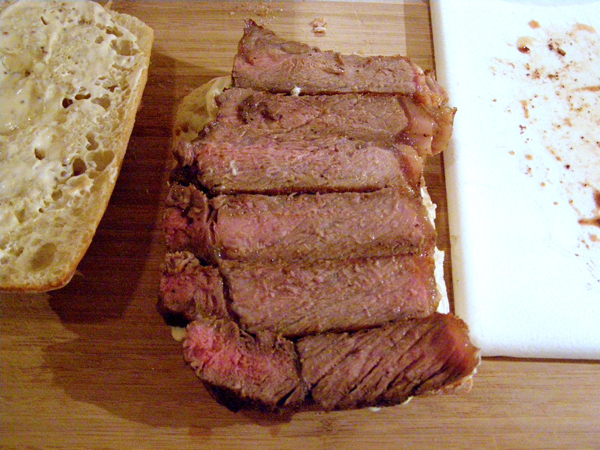 This Steak Sandwich is another Ina Garten recipe with minor tweaks by me. I cook so many of her recipes because, well, she’s simply the best and this is a real man-pleaser. If there’s a guy you want in your life, make him this sandwich and he’ll follow you forever. If there’s already a guy in your life, make him this sandwich and he’ll think he’s died and gone to heaven. BeeBop really loves it. Just be sure to give them plenty of napkins along with it. Season the steak liberally with salt and pepper on both sides. 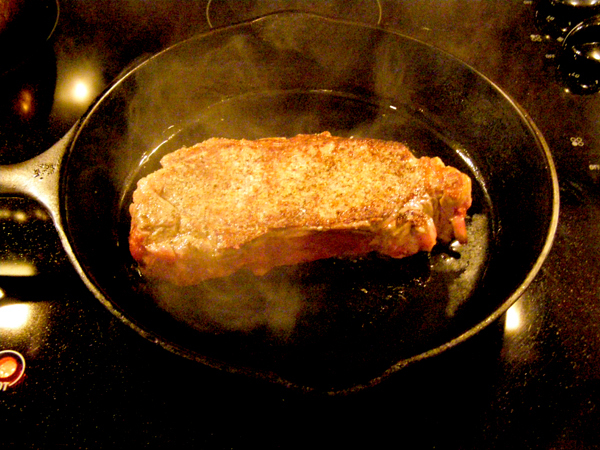 Heat 1 tablespoon of olive oil in a medium saute pan over high heat until it’s almost smoking, then sear the steak for about a minute. Turn it over and sear the other side for about a minute. The pan should be very hot while you’re searing. 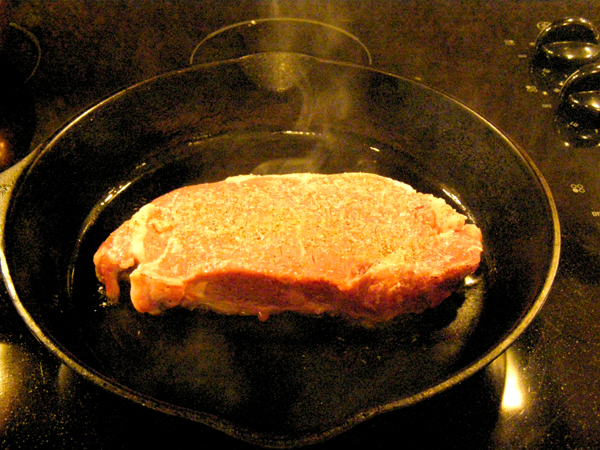 I used an iron skillet because it gets really hot and holds the heat for a long time. 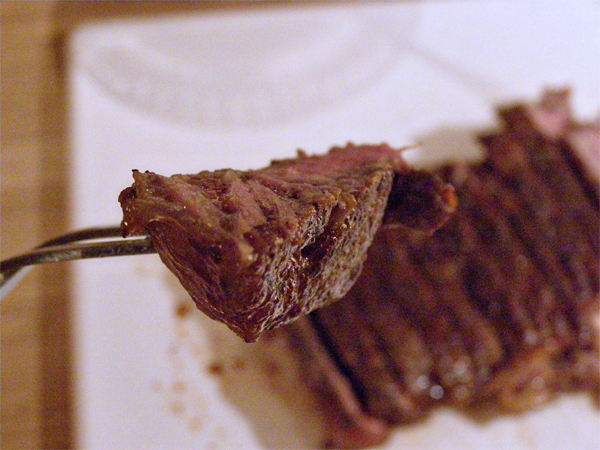 Reduce the heat to low and cook the steak for about 7 to 10 minutes for rare, up to 15 minutes for well done. Remove to a plate and cover tightly with foil, and allow to sit for 10 minutes while you cook the onions. Use the same pan but don’t clean it out. Just leave all that good brown stuff in there. Heat 1 1/2 tablespoons of olive oil over medium heat. Add the onion and thyme and saute for 10 minutes. Stir the often making sure you turn them over frequently so they all cook evenly and turn a golden, caramel brown. To assemble the sandwiches, first slice the steak on an angle. Spread Mustard Mayo on top and bottom of the bun. Or bread. Or baguette, or whatever you’re using. Place a layer of steak strips on the bottom of the bun, sprinkle with salt and pepper. 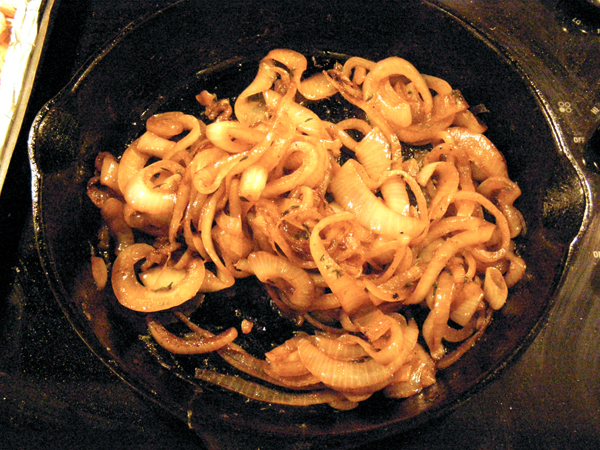 Top with the caramelized onions. 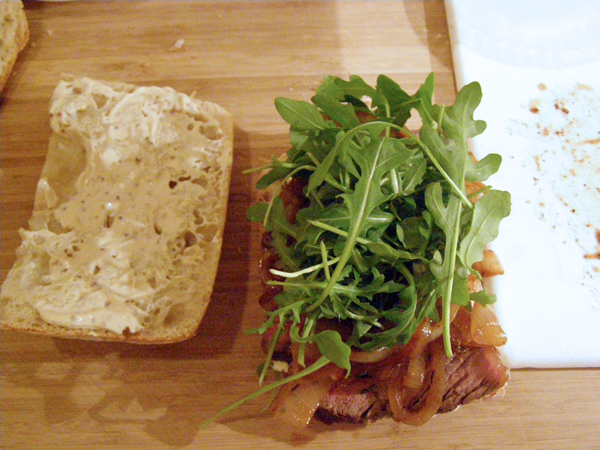 Place baby arugula on top of the onions and cover the sandwich with the top half of the bun. Just look at that thing. How manly is that! Of course, I like it, too! Stir all ingredients together in a small bowl. Set aside. Heat 1 tablespoon of olive oil in a medium saute pan over high heat until it's almost smoking, then sear the steak on each side for 1 minute. 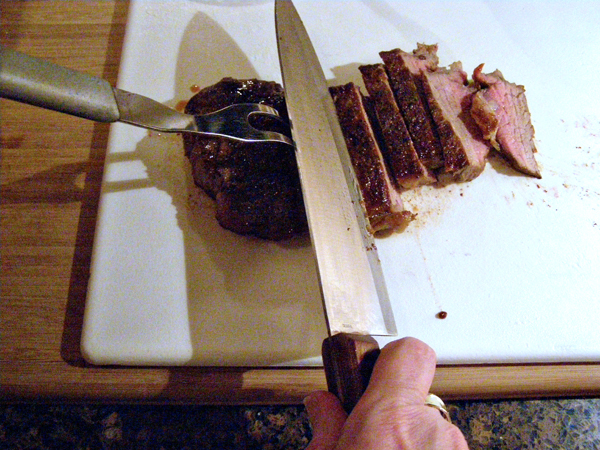 Reduce the heat to low and cook the steak for about 7 to 10 minutes for rare, up to 15 minutes for well done. Remove to a plate, cover tightly with foil, and allow to sit for 10 minutes while you cook the onions. Using the same pan, heat 1 1/2 tablespoons of olive oil over medium heat. 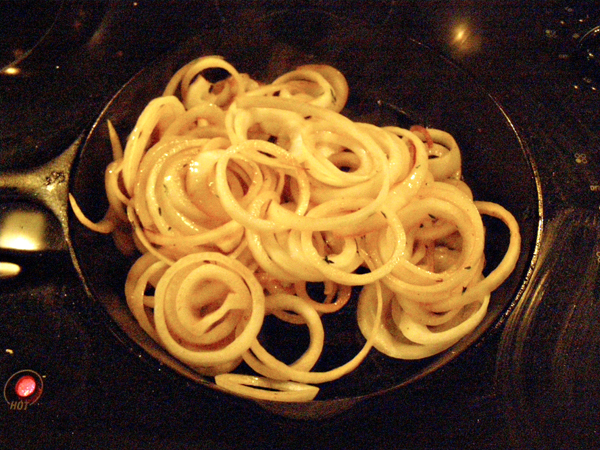 Add the onion and thyme and saute for 10 minutes, until the onions are brown and caramelized, stirring occasionally. 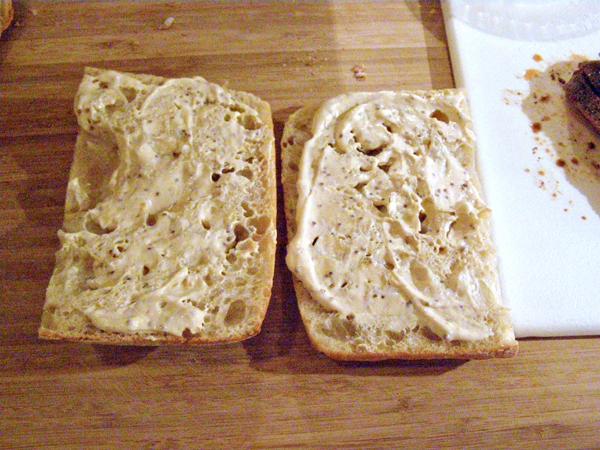 To assemble the sandwiches, spread Mustard Mayo on top and bottom of the bun. 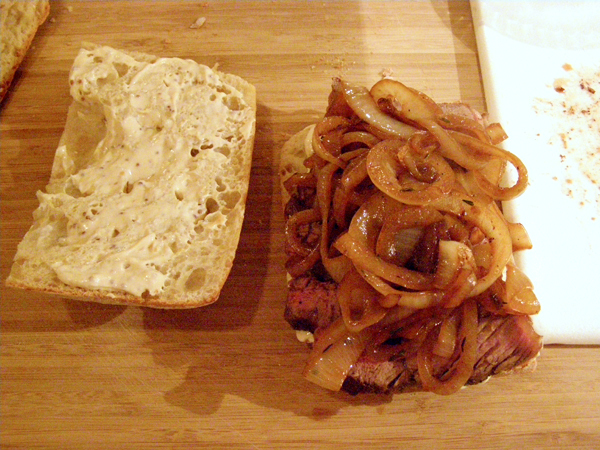 Place a layer of steak strips on the bottom of the bun, sprinkle with salt and pepper and top with the caramelized onions. Place baby arugula on top of the onions and cover the sandwich with the top half of the bun. All text and photographs on Never Enough Thyme are copyright protected. Please do not use any material from this site without obtaining prior permission. If you'd like to post this recipe on your site, please create your own original photographs and either re-write the recipe in your own words or link to this post. You had me when I saw the word “steak”.